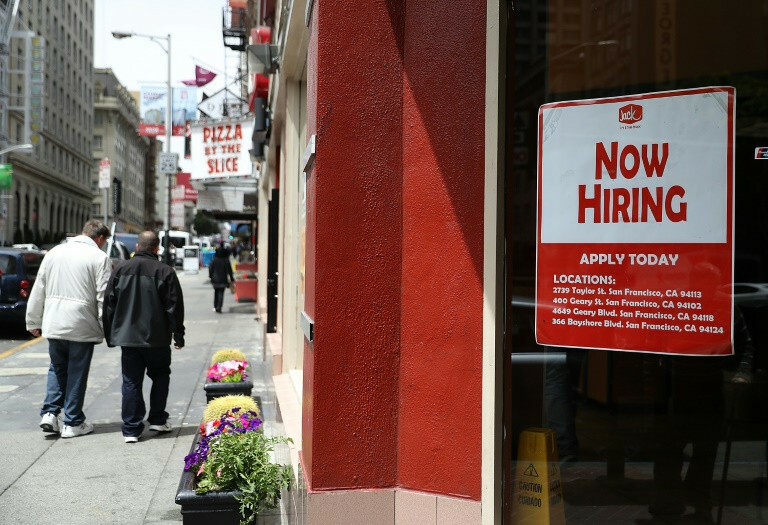 The US economy's job creation ability disappointed in December, despite solid hiring in manufacturing and construction, according to government data reported Friday. But with the country believed to be near full employment, the jobless rate still held steady at its 17-year low of 4.1 percent. Employers added just 148,000 new hires in the final month of the year, all but 2,000 of them in the private sector -- far below economists' expectations of 200,000 jobs or more. Those upbeat forecasts had been boosted by data from payroll services firms ADP Thursday that reported private hiring to have surged by 250,000 in the month, although the ADP report is known to be volatile. Revisions to the October and November data also subtracted 9,000 jobs from the economy, making the picture for the fourth quarter even more disappointing. Job creation in the final three months of the year averaged 204,000, the Labor Department said. The slowing could point to an economy nearly at full employment that is finding it hard to find workers to fill open positions, a sentiment seen in many business surveys. Many firms have reported the need to raise wages to attract new workers, and that was reflected in the increase in average hourly earnings to $26.63 from $26.54 in the prior month, and from $25.98 at the end of 2016. That marks a 2.5 percent increase in wages over last year, slightly ahead of consumer inflation. The manufacturing sector added 25,000 new jobs in December, while the construction sector added 30,000, and health care added 29,000. But retail employment fell by 20,000, and professional and business services slowed sharply to a gain of just 19,000 after two months, with increases of close to 50,000. For all of 2017, construction employment increased by 210,000, compared to 155,000 in 2016, while manufacturing saw a gain of 196,000, about the same as the prior year. Business and professional services jobs rose 527,000 for the year, about the same as 2016, while retail jobs declined 67,000 after adding 203,000 a year earlier. Analysts whose forecasts were proven wrong downplayed the low hiring numbers, and attributed them to the volatility inherent in the measurements. Stock markets also seemed to ignore the disappointing data -- released at the same time as the trade figures which showed November had the biggest deficit in more than five years -- pushing to new records. The Dow Jones Industrial Average jumped 0.9 percent to close at 25,295.87, just a day after closing above 25,000 points for the first time. The broad-based S&P 500 gained 0.7 percent to 2,743.15, while the tech-rich Nasdaq Composite Index advanced 0.8 percent to 7,136.55. Jim O'Sullivan of High Frequence Economics, who forecast a payrolls gain of 210,000, said of the December result, "the miss was not especially large given normal volatility and there is no sign in other data of the trend weakening." He noted monthly job gains averaged 171,000 last year "during which time the unemployment rate fell 0.6 points." Ian Shepherdson of Pantheon Macroeconomics likewise viewed the low number "as noise rather than a shift in the trend." "It's possible that payroll growth is being constrained by the lack of available supply, but we're not going to make that argument on the back of one month's numbers," he said in a research note. The question remains how the US Federal Reserve will view the report. The central bank increased the benchmark interest rate three times last year and is expected to hike three more times in 2018. Policymakers are closely watching the labor market for any signs it could be pressuring inflation. Economists widely expect a rate increase in March, and job creation would have to slow much further to change that. 0 Response to "US job gains disappoint, unemployment holds at 4.1%"